For some reason my default reading of the title is a machine that produces soft, rather than a machine that is soft…i dont really know what’s up with me either. A notion from Simon O’ Sullivan that I really like is that when political/ethical/theoretical discourse gets stuck in a rut and begins looping itself, literary fiction comes along and “scrambles the known codes, upsets the accepted formulae.” Burroughs’ experiments with cutting up text and with chance-based composition square with the upheavals occurring in the humanities in the sixities — THE SOFT MACHINE rails against the comforting neutrality of language and reality, showing words, time, and space to be finite dimensions that can bottom out at any moment. 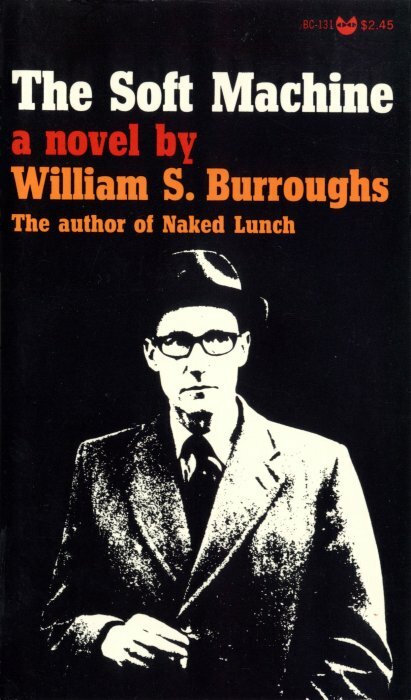 Not that Burroughs had any stock in reality to begin with. His serious investment in conspiracy theories embodies all the antisemitism that implies, and his contempt for women reeks from at least a few of these pages. His style was the kind of discipline that cant really be accommodated by books or by publication since his texts arent things that can be “finished.” Like Wong Kar-wai, whose movies are made in the editing room with change after change right down to premier hour, Burroughs constantly re-mixed and re-issued, even cutting and taping changes to the galleys. Oliver Harris in the introduction has to inform us that SM is not only the first volume of the Nova trilogy, but is itself a trilogy of three different editions. Needless to say you dont really know what’s going on as you read this work, which is basically the result of cutting together deleted scenes from NAKED LUNCH with a swath of other material, both original and from other writers, to form an acid space opera. But im totally on board with this cut-up/fold-in practice. If conventional novels create stable, “realistic” worlds that you could almost step into and explore, then SOFT MACHINE itself, like the best experimental novels, feels alive with all its undulating sliminess and organic froth. Not recommended for readers with insect phobias. This next part of the book is quite long but fast by virtue of its odd formatting. It’s a single narrative block which delivers the speech of a pirate broadcast that segues into an odd story set in a dense forest. By the end i think we’ve developed some of the ideas raised in the last section in a more abstract way, especially regarding the ways our social/economic climate keeps us isolated from each other, and the possibilities for communication or establishing some kind of connectedness.